We spotted lots of Pine Ladybirds, Exochomus quadripustulatus, in our street today. They were crawling on tree trunks on the sunny side of the street, a couple of pairs mating, some still in a little group overwintering together and others just stretching their legs. They used to live mostly near pine trees, willows and sallows, but pine trees are very scarce in our area and I haven't seen any in our street. I assume in our street they feed mainly on scale insects, in particular the Chestnut Scale insect, Pulvinaria regalis, which feeds on trees, including Lime and Sycamore, producing occasionally heavy infestations. 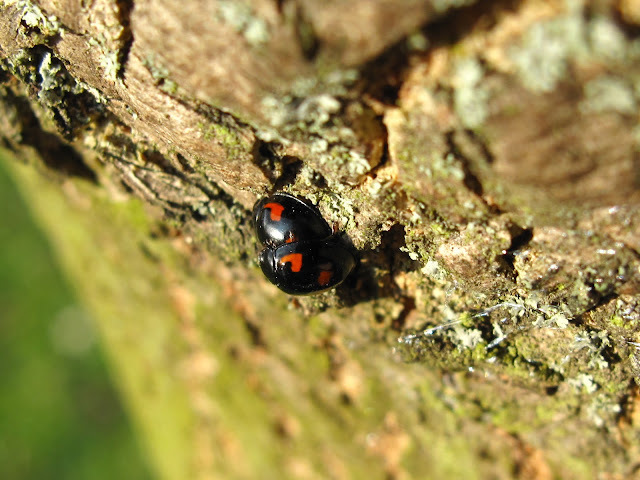 Some colour forms of the Harlequin can be similar to the Pine Ladybird, but there are always white marks on the Harlequin pronotum, while the Pine ladybird is all black, with 2 or 4 red spots, the frontal ones with a characteristic comma shape. 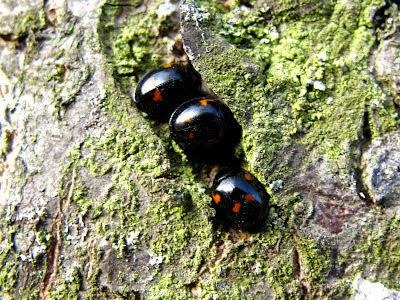 Pine ladybirds are also smaller, 3-4 mm, and have a rim in their elythra reminiscent of a bowler hat as you can see in the photo below. I've not seen any E.4-pustulatus so far this year, but hundreds of 7-spots, one Adonis, one 22-spot and just three Harleys. I only noticed them because my eldest daugher pointed them out on the tree trunks. 7 spots are so massively abundant this year. Even Harlequins seem rare.